If you want posh surroundings; don’t bother. If you want good food, a good atmosphere and friendly service then it’s a great place to go. A little out of the town centre but that just gives you the opportunity for a stroll there to build up your appetite and a wander back home/hotel to let your meal settle. This was my first visit to The Italian Connection but more than likely not my last. I have been many times to the Italian Connection with friends and family and never been disappointed. Adel, the owner, always has a smile for all her customers and gives great service. The food is excellent and well priced, and the restaurant has a nice welcoming atmosphere. Once you have visited this restaurant you’ll be back!! 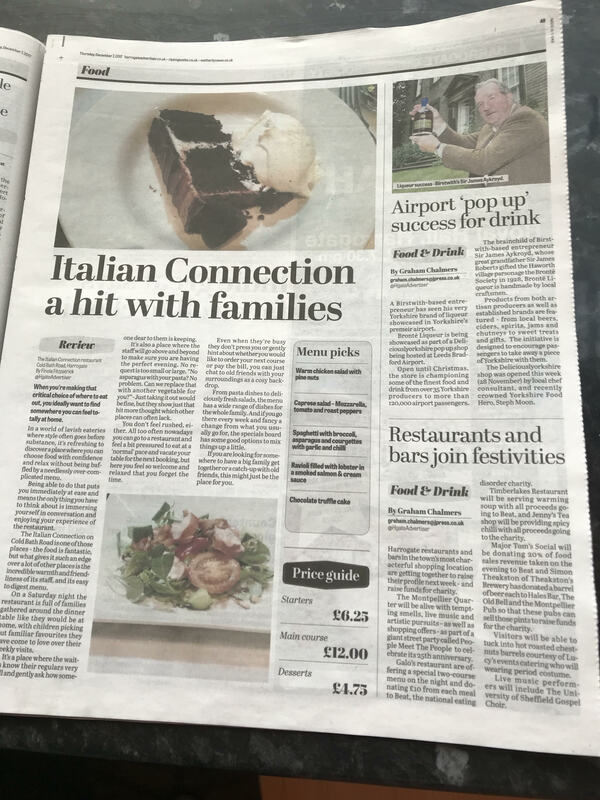 I have eaten at the Italian Connection on a number of different occasions, in small and large parties and have always experienced fantastic service from the staff and amazing food. It is a lovely cosy little place with a good choice on the menu, something for everyone and their roast potatoes are to die for. Would definitely recommend if you want something a little different to the high street chain Italian’s. I dont know why but weve lived in harrogate for years and never eaten at the italian connection untill now. My wife and I had a great meal there last night and we were both very impresed , not only with the friendly service but the interesting choice on the menu. The quality of the food is really good and well priced. Im looking forward to my next visit.